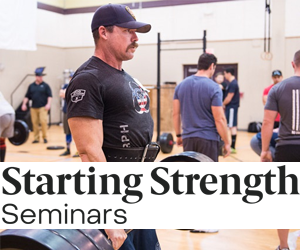 Greetings and thanks for all the resources you and the Starting Strength team have made available. They have been immensely helpful to me in the short time I’ve been exposed to them. I agree with Ripp, but it also depends on what you mean by "offering advice" to people. If you're simply approaching someone to give unsolicited advice or to correct their form during a certain lift I would make sure that its because there is a safety concern involved (such as a guy attempting to quarter squat 500lbs or something else just as dangerous). Of course one could argue that any time a person uses improper form it becomes a safety concern, but if we were to go around correcting everyone's form in the gym we ourselves would never get a workout in. I think that if approached by a person in the gym and given a specific question to answer, then at that moment you should give them the best advice/answer to your current knowledge. When that happens to me, I always give reference to Ripp or this site or wherever I obtained the information from so that the person can then research the topic on their own. I would make sure that its because there is a safety concern involved (such as a guy attempting to quarter squat 500lbs or something else just as dangerous). What is inherently dangerous about a 500-lb quarter-squat? Which ever you prefer to use. The inability to control it below the quarter-squat depth. Gravity, like the Moon, is a Harsh Mistress. Typically, a squat fail involves some knee flexion. This is a walk-out fail. But I'm curious about how a quarter squat would ever look like a goodmorning, since knee flexion would be required to get to quarter-squat depth. Sorry perhaps I should have been more detailed in my description. 500lb quarter squat that resembles that of a good morning more than a squat. The quarter-squats I typically see are more of a shallow knee bend, with the torso kept completely upright. Maybe your gym is different. True, but that's the case any time someone does more weight than they can handle. Since most people quarter-squatting will never approach a depth that actually challenges them, I think they're pretty safe from catastrophic failure. A quarter squat does require knee flexion, but it can look like a good morning in the since that the person is basically bending over with the bar on their back while attempting to do a squat. I've seen this several times in globo gyms with inexperienced people attempting to perform a squat with too much weight on their back. As far as the video goes, I think its more than just a walkout fail. It's an overall safety fail on the lifter and those around him who watched him attempt the lift. Giving advice on a lift isn't just technique, it expands and goes to telling a person to drop the weight and perform a set that the lifter is capable of doing. Or possibly having a few spotters would be nice, maybe a few bright individuals to tell the lifter to clamp the weights at the end so they don't have what happened to Lee Moran? I think everyone is taking what I said about the quarter squat a little too literally. I'm just against giving unsolicited advice to people in the gym unless I see that there is a safety concern that could hurt the lifter or someone else. That includes seeing a lifter attempting too heavy a weight with incorrect form which could result in strains, pulls, tears etc. All too often do we read on here about lifters having a stranger come up to them to "offer advice" on our low bar squats or our depth is too deep, or whatever stupid thing they believe they see wrong with our lifts. So again, in my opinion unless there is an inherent safety risk, or you are employed by the gym in a trainer position, then don't offer advice unless asked, but that's just me. Quarter-squats are usually knee bends, so I'm with Herbie on this. I've never seen a quarter-goodmorning. The video is merely an intelligence failure -- these are obviously very simple people. But your point about unsolicited advice in the gym I have made several times: Mind your own business unless you're asked for your opinion or getting paid to offer it.